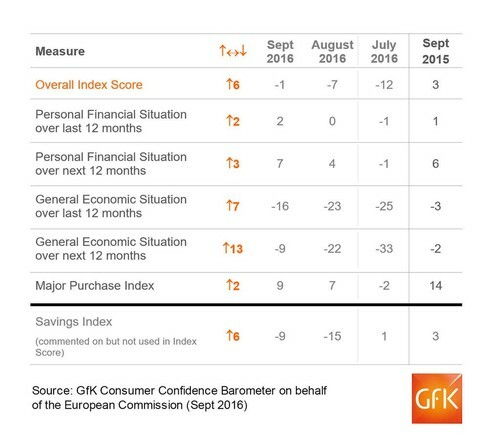 GFK‘s long running Consumer Confidence Index has reported a rise across all measures. During September consumer confidence rose for the second consecutive month to the highest level since June. The report has found that sentiment was up by six points compare to last month as all five of the measures used to calcaulate consumer confidence rose. The figure now stands at -1 on the index. Consumers reported increasing confidence in their finances for the year ahead, rising three points to seven, and outlook of the general economy rocketed by 13 points to -9 as Brexit fears continue to subside. “Optimism is returning to UK consumers following the dramatic collapse in confidence after the recent Brexit result,” head of market dynamics at GFK Joe Staton said. “The six-point jump to -1 restores the Index to June‘s pre-Brexit levels, driven by improved expectations in our personal financial situation, perceptions of the general economic situation and intentions to make major purchases. Staton goes on to say that wages are increasing faster than prices which is great for the economy and consumer confidence. Despite promising statistics Staton warns that confidence could be “misplaced optimism” and that any bad economic news could send the index back into a spiral.